The article below was written by Clinton Collier. He is a certified dance instructor currently living in Toronto, Canada. 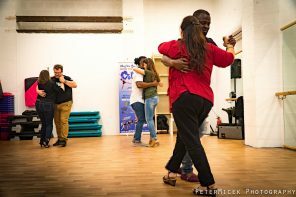 He submitted his article/recommendations on Dance Etiquette to us via the Latin Dance Community Facebook page and we’ve decided to share it with you all. Check it out! It’s just a couple of minutes out of your life and an opportunity to make someone’s night, encourage a beginner or make a new friend. That being said, it’s also good etiquette to ask someone near your own level. Slightly better is fine, we all want to learn: but if you’re a beginner, probably not a good idea to ask the best dancers yet. Hone your skills and work your way through the levels: beginner, intermediate, advanced. Stay within your level. Responders; it’s courteous and magnanimous to say yes to a person once. Feel free to say no if they ask again the same night. Sharp rings and bracelets can cut and scar. Latin dances are often fast with quick arm movements. You can tell advanced dancers because they’re the ones with no jewelry (they’re rigged to fly LOL!). Beginners: don’t try to dance with something in your hands! Focus, grasshopper! If you’re worried about people stealing stuff, don’t bring anything with you that you can’t afford to lose. If you have a bag, put it down and try to keep an eye on it or have your friends do the same. We offer the best dancefloor in the city, that being said, for a dancer, any dance floor deserves respect. There’s nothing worse than someone spilling their beer on the floor and you wiping it off with your new dance shoes. Respect the floor and keep it safe for other dancers please. Advanced dancers respect their partner AND OTHER DANCERS and keep them safe from getting hurt. You need to learn how to dance without putting your partner or other dancers at risk. This means keeping it small if the floor is crowded. It means not taking big back steps or swinging your partner out into the path of other dancers. If you or your partner do step on someone, show some courtesy and take a moment to acknowledge it and apologies…usually eye contact, a nod and rueful smile will show you’re sorry. Ladies, if you are dipped, know that you’re not supposed to drop your body weight on your partner – you’re supposed to support your full body weight so you keep yourself safe at all times. Gents: don’t dip or do a trick with someone you don’t know without asking them first. Some of us have neck or back or shoulder problems and don’t want to get hurt. If you just turned someone down, it’s rude to get up and dance immediately with someone else. Don’t keep stepping on someone. If you do, it’s your fault. Go find somewhere with more space or take smaller steps. One good rule of thumb is: the faster the dance, the smaller the steps! When I started, 5 years ago, I got turned down to dance a lot. I wasn’t a good dancer, so people were leery. 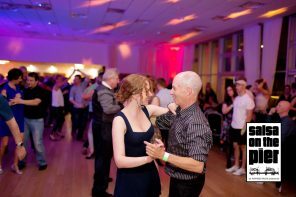 Now I’m a bit more experienced as a social dancer (and a dance champion), based on my experience, here is my advice to you. It’s going to take you a couple of hundred hours of practice and dancing to become a competent dancer. Let me suggest to you that in a thousand or so dances you will have a much better idea what you’re doing. So relax into the process. It’s going to be frustrating as heck at first. You’ll be awkward and people won’t want to dance with you because you lack skill and competence. But we all start here…don’t worry about it. It’s a part of the process. The trick is to dance every opportunity you get. You have one thousand dances to get through in order to be competent, so get to it. You can do it in three months or 5 years…your choice. Dance every opportunity you make and before you know it you’ll be through the learning curve and finding dancing more enjoyable. You can dance championship steps like a beginner, or you can dance beginner steps like a champion. Learn to do the basics well and everything you do later is going to look better. One of the things I appreciate about latin dancers who have never had lessons, the cumbia crew and others who grew up dancing as part of their culture, is that they don’t do a lots of fancy stuff, but what they do they can do beautifully. Another important lesson I’ve learned. At the end of the day, dancing is about a connection between two people. It’s about giving a little of yourself and ensuring your partner is having fun. Advanced dancers, don’t do advanced steps with a beginner, make a connection and try to dance at that person’s level. Make it fun for them. Ladies, don’t be too hard on the guys. If the guy is simply doing steps, then he’s still learning and trying to figure out what’s coming next. He’s not ignoring you, he just hasn’t reached that level of competency where he can reach out and connect with you yet. Make eye contact, smile and realize that at the end of the day, the best dancers on the floor are those having the most fun. So have some fun! Clinton started dancing at age 49 after a back injury forced him to quit playing tennis. To help improve his back, a friend suggested he take up salsa. He started dancing Casino Rueda at the University of Waterloo then took salsa with Nico Kaburia at Flying Dance Company in Guelph, Ontario. From there he became serious about competing in both latin and standard international dancesport, training with world class coaches 7 days a week for 5 years and winning his way through all the dancesport levels and at many championships along the way! He is now a certified dance teacher in both latin and standard international ballroom dancing and teaches on cruise ships; having completed more than 50 cruises as a dance teacher and host on the Queen Mary 2 and Queen Elizabeth 2. 1- Hygiene – You don’t have to smell like you soaked yourself in Guerlain but at least taking a shower with soap before and applying deodorant should be a must. Unfortunately I’ve had to turn down lots of gentlemen because of this. Uncomfortable smell can make a person nauseated and sometimes that smell has stayed on my clothes after I go home from dancing. And like you said, smile to your partner during the dance. You never know what kind of friendship might evolve from a dance. I met my husband at a Salsa Party. We didn’t hit it off right away but we were always smiling. But dancing is not all about the moves, it’s about learning to dance to the music. So, I would begin with understanding that there is an 8 count in 90% of all music in the world. Then work your simple and easy combinations into this 8 count. And practice by tapping your foot to this 8 count while you are taking a break in between dances. Very good and well explained tips about this type of social dance. Keep it up . You know, I got to disagree with number one. If someone is giving off bad vibes, it’s totally okay to tell them “no” if they ask for a dance. And “No./ No thanks.” is a complete sentence. There’s no need to fake-justify why you don’t want to dance. If they demand why, that’s a big glaring red flag. Way, way too many women feel pressured to never say no as it comes off as rude and end up never coming back to a dance because some guy was awful to them.